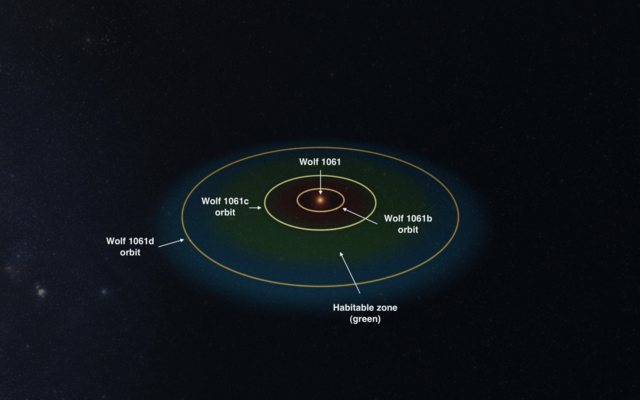 Australian astronomers have spotted the closest exoplanet within the habitable zone of its star to Earth, dubbed Wolf 1061c, is just 14 light years away. The team of scientists, led by Duncan Wright, used data collected by the HARPS Spectrograph (High Accuracy Radial velocity Planet Searcher), an instrument installed on ESO’ 3.6m telescope in Chile, to detect the planet. HARPS is dedicated to identify small extrasolar planets, rather than the larger objects, Jupiter-sized planets typically found by radial velocity. We now that small rocky planets are abundant throughout the galaxy, as well as the multi-planet systems appear to be common. However, most of the rocky planets we’ve discovered so far are hundreds or even thousands of light years away. An exception is Gliese 667Cc, an exoplanet discovered back in 2011, located 24 light years away from us in the constellation of Scorpius, orbiting Gliese 667 C, which is a member of the Gliese 667 triple star system. This is why the discovery of Wolf 1061c is so particularly exciting. So, what we know about Wolf 1061c? Wolf 1061c is located in the constellation Ophiucusmore orbiting its host star, formally called Wolf 1061 (which is also the 36th nearest stars to Earth) every 18 days. Wolf 1061 is a red dwarf “M-type” star a small, relatively cool and stable star just 14 ly away (I know I’ve said that before). The star system consisting of 3 planets Wolf 1061 b, c and d having periods of 4.9 days, 17.9 days and 67.2 days. All 3 planets are categorized as super-Earths, with their masses at least 1.4, 4.3 and 5.2 times that of Earth, respectively. says Dr Wright ~ lead author of the study, will be published in The Astrophysical Journal Letters. It is fascinating to look out at the vastness of space and think a star so very close to us—a near neighbour—could host a habitable planet. You have one very hot side and one very cool side. The next step will be for telescopes to look at Wolf 1061 and search for “transits” of the planets in front of the star. This will allow scientists to find out more about this planetary system. I think once people have had a good look at the data and get to grips with what we’re saying, I think they will be pretty pleased with the detection. In fact, I imagine there will be a number of telescopes pointed at the star in the near future, hoping that it in fact transits. And we can start to do atmospheric detections. So if we are lucky in the near future we could find many, many more planets and start to investigate the atmospheric properties of these types of planets. And maybe, just maybe, discover the presence of life on some of these exoplanets.